Clouds slid past beneath me as the Mystic Bicycle rose into the aether. I stopped pedalling for a moment, the wings falling still as I drifted beneath the balloon of Vernian gasses that kept my trusty vessel aloft. Unclipping a butterfly net from its place against the frame, I caught one of the passing pieces of scrap. On close inspection, it proved to be a fragment of hull from an aetheric ironclad, possibly an American vessel destroyed during their civil war. Fairly common, as stratospheric scrap went, but not without value. I put it in one of my baskets and closed the wicker lid tight. This was the first time that I had flown so high in scavenging, a word I choose with care. Whatever terms others may use to dignify this work, we are little more than mudlarks of the air. Up here there was not just ordinary scrap. There were escaped devices. 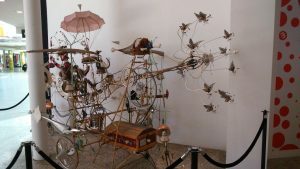 I saw clockwork birds such as are given to well-behaved children at Christmas. There was a canvas weather balloon, its propeller stirring in the breeze. There were levitating messenger boxes and unexploded aerial torpedoes, around which I navigated with care. As I rose higher, I saw that there was a whole ecosystem here. Clockwork finches steered their messenger boxes nests clear of torpedoes and mines. Wind-up bats, probably escapees from some Germanic folly castle, brought combustibles to fuel a flying waggon, then took it in turns to wind their mechanisms using its steam vents. Many of the machines appeared to have been repaired, mismatched patches and solder adding variety to their forms. Soon my baskets were half-full and my arm aching from netting so many escaped devices. I felt terribly pleased with myself, perhaps even a little smug. Then came the attack. Large birds swooped down as I approached a cuckoo nesting on a floating clock. Ravens, gulls, and even something like a falcon struck the Mystic Bicycle. A was almost flung from my seat, teetering precariously above oblivion. They ripped at the baskets with beaks and claws. I tried to knock them away with my net but they kept returning. Reluctantly, I drew my old service revolver and let fly. The shooting bronze on my mantle piece is no stolen scrap, but a tribute to the skills of my youth. I was pleased to find my aim still sharp. One by one, the birds tumbled from the sky. As the last two gave up their attack and flapped away, I decided to follow. If I could take them intact they would be a valuable prize, perhaps enough to buy new wings for the Bicycle. Pedalling hard, I spiralled up after them, through a layer of cloud and into clear skies. The handlebars were wrenched from my grasp as a fierce wind caught the Bicycle. As I was swept across the cloud tops I looked back to see fans rigged from old aetheric metal and mismatched gears. Someone had made that wind. Bursting through another cloud bank, I saw the crows ahead of me. They circled around something far larger. A mass of machines connected together with cogs, spindles, and fan belts. On a flat area at its front lay damaged devices across which mechanised tools were moving – soldering, screwing, winding, gluing. In delight, I drew my butterfly net. A dozen more machine arms appeared above the others. Each of them pointed a gun my way. The mass of machines shifted. I swear by the Almighty, it somehow seemed to smile. Discretion seemed the better part of valour. Besides, it was time to change my trousers. Clipping the net back in place, I turned the Mystic Bicycle’s nose down and headed out of the heavens. I shall not be returning to the upper air. But if you would care to purchase a clockwork cuckoo, this one is going very cheap. 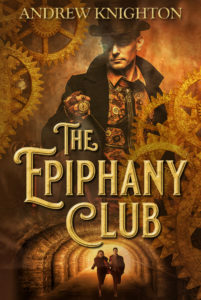 If you enjoyed this story then you can get a free ebook of steampunk stories by signing up for my mailing list. Go on, you know you want to.